Published on April 17, 2013 in Uncategorized. Closed Tags: agriculture, crisis, greece, manolada, repression, struggles and resistance, workers rights. Manolada strawberry farmers shoot immigrants who demanded 6 months salaries. More than 20 wounded in hospital. The immigrant workers had reportedly gathered to demand six-months’ worth of unpaid wages when one of three work supervisors whom they were negotiating with shot them. 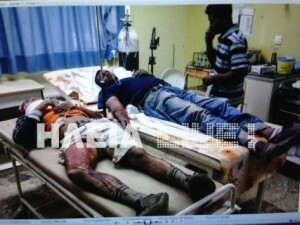 About 20-30 of the 200 strawberry pickers from Bangladesh got injured. Local media reported that four of them are in a serious health condition. The employer has been arrested and investigations are going on. Only one day later some of the in Patras hospitalised migrants instead of left to go home were arrested for lacking valid residence permits and transferred to detention for deportation. Several thousand migrant workers (many of them reportedly undocumented) are empoyed as strawberry pickers in the area. This is not the first time that immigrants in Nea Manolada have protested against harsh working conditions. 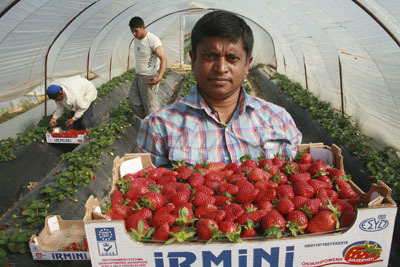 In 2008, immigrant farm workers staged a two-day strike (delaying the shipments of strawberries by at least a few days) to protest against harsh working conditions. Their strike exposed slave wage exploitation, shocking living conditions and prejudice. The government at the time responded to the strike by ordering labour inspectors to crack the whip on farmers exploiting migrant workers in Nea Manolada. Despite the country’s soaring rate of unemployment, agriculture is heavily reliant on immigrant labour. In 2009, two farmers in Manolada, alleged to have tied two Bangladeshi immigrants to a motorcycle and reportedly dragged them through a central square.